Ruth Hanson, 96, of Augusta, passed away late Wednesday evening, January 23, 2019 at Augusta Health and Rehabilitation. Ruth, daughter of Alfie and Hattie (Moore) Hall was born June 28, 1922 in Augusta. Ruth was united in marriage to Marvin Hanson on September 20, 1941 at the First Baptist Church in Augusta,officiated by Rev. Donnelly. The couple farmed the first 19 years of their married life. Ruth worked at Dolly Madison Ice Cream in Eau Claire and later as a bank teller at Peoples State Bank in Augusta. In 1973 Ruth and Marvin moved to Chicago, where they were employed as caretakers for a family on their home estate. In 1977 they moved to North Minneapolis, where they worked for the Olivet Baptist Church. In 1987 Ruth and Marvin retired and moved back to Augusta. Ruth’s strong faith was always the center of her life. She was a life long member of the First Baptist Church in Augusta, where she was active in Bible studies, served as a Sunday school teacher and helped in many other capacities. 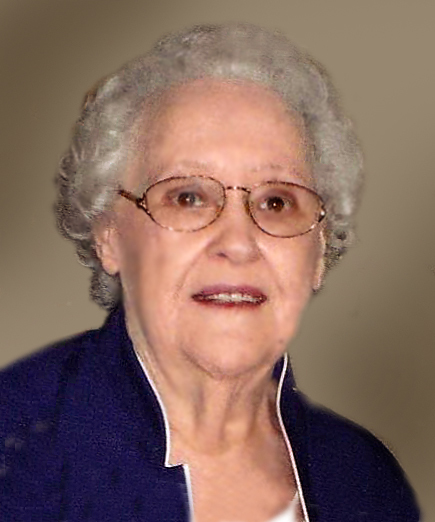 She was an active supporter of the Augusta Senior Center and volunteered wherever needed. She also enjoyed volunteering at the Augusta Nursing Home and especially reading to the residents.Ruth was known in the area as the “Doll Doctor” as she repaired and dressed many dolls for individuals. She also had a vast collection of her own dolls that she purchased over the years. Ruth is survived by 2 sons, Bob (Joyce) Hanson of Tomah, Mike (Phyllis ) Hanson of Chippewa Falls; daughter-in-law Wallie Hanson of Eau Claire; grandchildren, Mike (Darlene) Hanson, John (Linda) Hanson, Sandy (Jason) McFadden, Nicole (Adam) Hart; great grandchildren, and step grand and step great grandchildren. Ruth was preceded in death by her husband Marvin on April 16, 2002; son Bill Hanson; 9 sisters, 4 brothers and their spouses. Memorial services will be held Saturday, Feb. 2, 2019 at 11:30 a.m. at the First Baptist Church in Augusta, with a visitation starting at 9:30 a.m. at the church. The family is assisted by the Anderson Funeral Home in Augusta.